“What’s Your Flavor DC!” is back by popular demand! 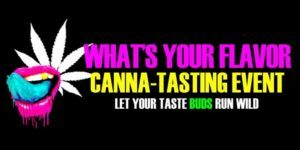 This event is brought to you in an effort to Feature DC’s up-and-coming talented Canna-Chefs. Enjoy the makings of top innovative products exclusive to the DC Canna-Community!! The Nation’s Capitol is growing immensely in relation to Cannabis. Initiative 71 has inspired many talented Ganjaprenuers and Canna-Chefs to develop incredible products! What’s Your Flavor DC! Brings you a chance to access those premium items exclusively! – GoodieBag- with participating vendor samples & pre-roll!